Duplicate File Finder provides you with the ability to change some settings or use useful options for a quicker and more efficient duplicate search process. 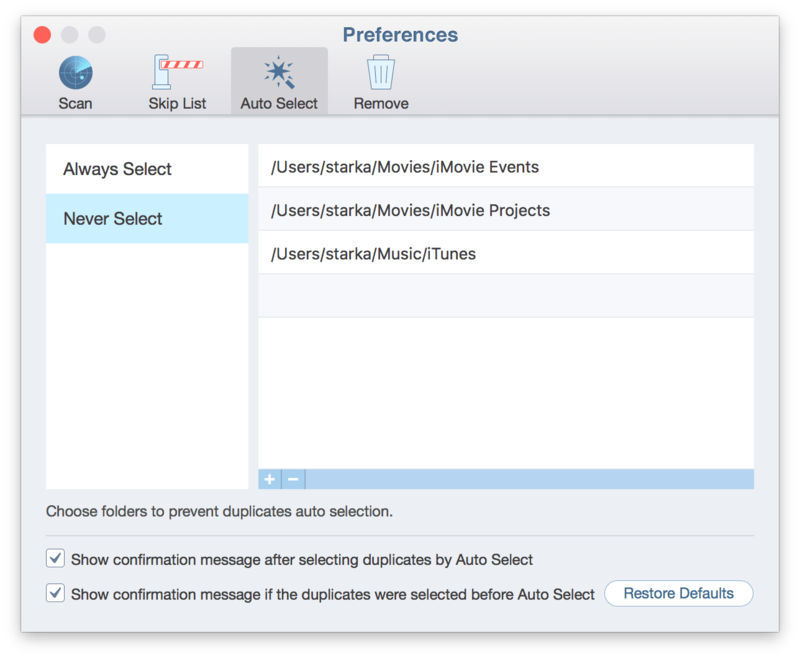 To open Preferences use ⌘, key shortcut or go to the Menu bar → select Duplicate File Finder → click Preferences. Here you will find four tabs: Scan, Skip list, Auto Select and Remove. Let’s take a closer look at each section of the settings. The application allows you to scan even hidden folders. To enable this option, just tick Scan Hidden Folders checkbox. Please note this option may slow down the scanning speed depending on how many hidden files you have. Here you can also set up the minimal size of the files that should be scanned. It will help you to speed up the scanning process by previewing only the biggest duplicates. Or you can scan absolutely all files and do a deep cleanup of your duplicates. 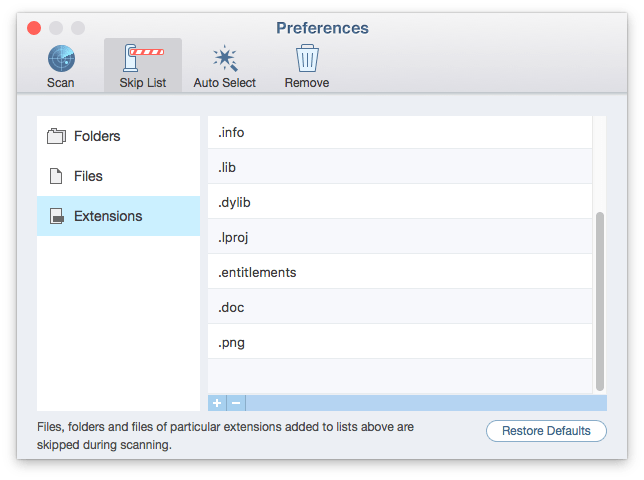 In this section you can select the folders, files or extension types to be skipped from the scan. Click the Plus button to add items or use the Minus button to remove items from Skip list. You can change the setting of the folders to be selected or never selected when you use the Auto Select button. 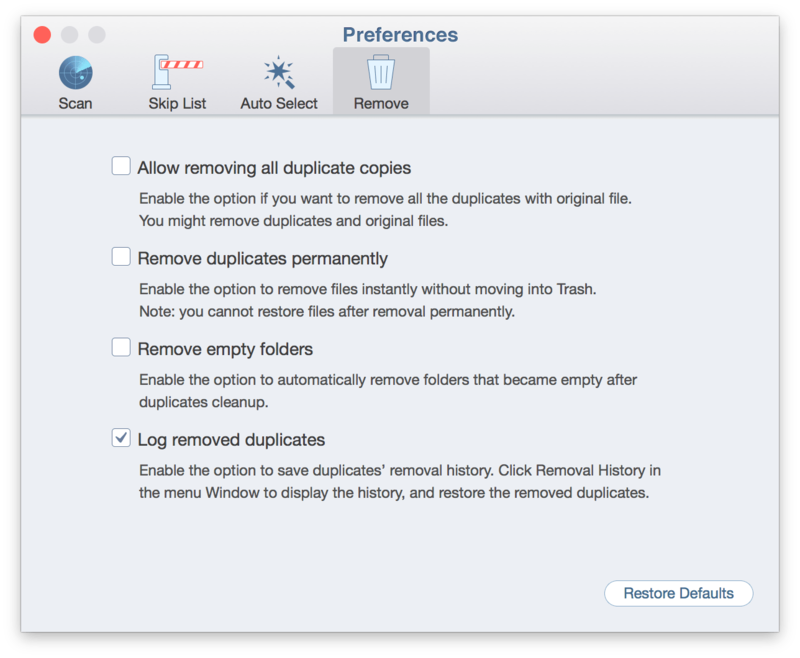 It’s a convenient option when you need to remove duplicates from folder A but preserve them in folder B. 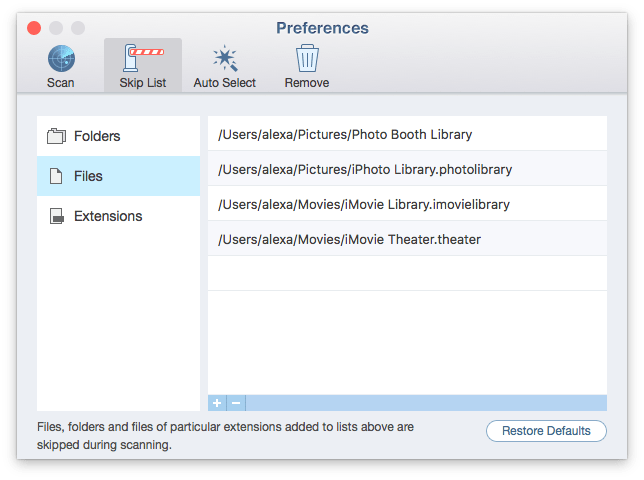 In this case, add the folders you want to the Never Select list to exclude them from selection, and add the folders you do not want to the Always Select list to remove them when the Auto Select button is used. If you need to remove all the duplicates of the original file, you can also do so by ticking the option “Allow removing all duplicate copies.” Don’t enable this option if you want to keep at least one duplicate item. Moreover, by default when you remove files with Duplicate File Finder, they are sent to Trash. Here you can enable the option to remove your files permanently without moving them to Trash.